It was 20 years, 7 months and 16 days ago when first lady Hillary Clinton stood clapping in the Rose Garden of the White House a few feet away from her husband, President Bill Clinton, as he signed the largest piece of crime legislation in American history—the $30 billion Violent Crime Control Act of 1994—known as the Clinton Crime Bill. That last major law on criminal justice provided for over $9 billion in funding for prisons and money for 100,000 more police officers. Speaking at Columbia University Wednesday, Hillary Clinton chose the subject of criminal justice on which to deliver the first detailed policy address of her presidential campaign. The speech reflected the sharp change in thinking on criminal justice that the crime legislation her husband mandated would have never envisioned. The former secretary of state called for an end to the era of mass incarceration in America and railed against overincarceration and unfair sentencing of African Americans. She also declared that there was something "profoundly wrong" with the American criminal-justice system as she spoke on the recent spate of police brutality cases resulting in the deaths of dead black men and boys in the news. The U.S. has led the world in the rate of incarceration for over two decades. African Americans are incarcerated at close to six times the rate of whites. "There is something profoundly wrong when African-American men are still far more likely to be stopped and searched by police, charged with crimes and sentenced to longer prison terms than are meted out to their white counterparts. There is something wrong when a third of all black men face the prospect of prison during their lifetimes. And an estimated 1.5 million black men are 'missing' from their families and communities because of incarceration and premature death," Clinton told the audience at Columbia University. "It's time to end the era of mass incarceration," Clinton said. "We don't want to create another incarceration generation," she added. She also spoke against mandatory minimums and focused on underlying economic causes and lack of opportunity. The sweep of Clinton's speech is in keeping with the current bipartisan trend on criminal-justice reform as Republicans have supported what Democrats have been pushing for years. That bipartisanship is seen in legislative partnerships between congressional Democrats such as Reps. John Conyers (D-Mich.) and Bobby Scott (D-Va.) working with Republicans Sen. Rand Paul (R-Ky.) and Rep. Raul Labrador (R-Idaho) to make changes in mandatory-minimum policy in several states. Clinton went a bit further than many Democrats have on justice reform. She spoke against giving civilian police military weapons and endorsed body cameras for every police department in the country. In June 2014, 27 members of the Congressional Black Caucus voted against an amendment that would have ended Pentagon Program 1033 in June 2014—the program that gives military weapons to civilian police. The Obama administration is also in favor of giving civilian police military weapons. Current Baltimore Mayor Stephanie Rawlings-Blake, a Democrat, stopped a police-body-camera bill forwarded by the Baltimore City Council in November, and Washington, D.C., Mayor Muriel Bowser is slowing down a police-body-camera bill in the nation's capital, citing privacy issues. In Congress, several Democrats, namely Sens. Chuck Schumer (D-N.Y.) and Dianne Feinstein (D-Calif.), have avoided speaking against mandatory-minimum sentencing. With her sweeping address on criminal justice, Clinton is keeping pace with Republican presidential contender Paul, whom she mentioned during her address. Paul has spoken out often on justice reform and partnered with Democratic Sen. Cory Booker (D-N.J.) on a bill, the REDEEM Act, which would allow juvenile records to be sealed for nonviolent offenders. He also assisted House Democrats in passing the Death in Custody Reporting Act signed into law by President Obama in December. On April 22, Paul again spoke strongly against over incarceration. "The incarceration binge is out of control and it's time we get together, both Republican and Democrat, and fix it," Paul said, adding, "We should repeal, once and for all, all mandatory minimums." At Columbia, Clinton was specific to run off the names of recent victims of police brutality and mentioned Michael Brown, whose death at the hands of former Ferguson, Mo., Police Officer Darren Wilson kicked off an unprecedented round of activism against police brutality, as well as Walter Scott, Eric Garner, Tamir Rice and Freddie Gray. Though the Death in Custody Act became law in December, there has yet to be any major federal response to the recent spate of police brutality cases. A report on the Ferguson Police Department and the death of Brown was followed by no action. A White House task force on policing yielded a "roadmap for reform" but no action. On the local level, several cities, including Los Angeles, have implemented the use of body cameras. "We need to restore balance to our criminal-justice system. 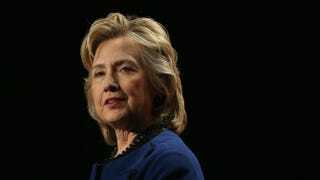 Of course it's not enough to agree on policy and give speeches about it," Clinton told the audience. "Progress will not be easy despite the consensus on reforms," she concluded.